Nearly $5 million in internal pilot grants to jumpstart research projects. A tripling in the number of clinical and translational research publications. Novel research tools that have been snapped up by scientists around the world. These are just a few of the achievements of the Vanderbilt Institute for Clinical and Translational Research (VICTR) during the past five years. “These are phenomenal numbers. 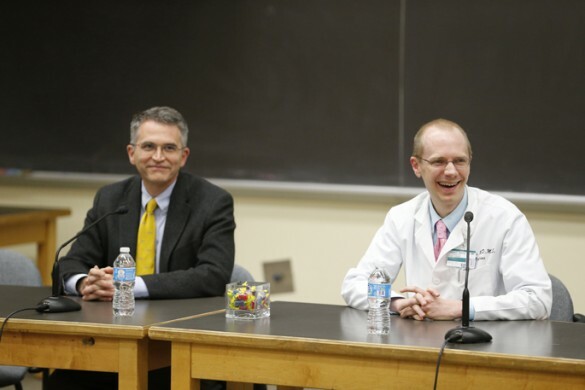 I am very proud of the VICTR team for making this happen,” VICTR director Gordon Bernard, M.D., associate vice chancellor for Research, said Tuesday during the first annual VICTR Research Symposium at Vanderbilt University Medical Center. VICTR was established in 2007 to administer Vanderbilt’s Clinical and Translational Science Award (CTSA) from the National Institutes of Health (NIH) and to build an efficient framework for conducting biomedical research with Nashville’s Meharry Medical College. In July the CTSA was renewed for another five years for $46 million. “One of the key missions of VICTR (is) to remove impediments to translational research,” said Shari Barkin, M.D., director of the Division of General Pediatrics. “And the greatest impediment is not having access to training or resources. We are resource-rich here at Vanderbilt. Paul Harris, Ph.D., director of the Office of Research Informatics, discussed tools he helped develop such as StarBRITE, an online research portal for Vanderbilt faculty and staff, and the REDCap (Research Electronic Data Capture) system, which is used for more research enterprise solutions across U.S. academic medical centers than any other data management tool. “What’s next? Some of the coolest stuff you can imagine,” Harris said. One innovation is “ROCKET,” a “toolkit” for research organization and collaboration. The Synthetic Derivative contains clinical information derived from Vanderbilt’s electronic medical record (EMR) that has been stripped of personal identifiers. It is used in conjunction with Vanderbilt’s DNA databank, BioVU, to explore the genetics of disease. With more than 1.7 million medical records tied to more than 170,000 genetic samples, BioVU currently is the world’s largest, de-identified, EMR-linked searchable repository, Denny said.